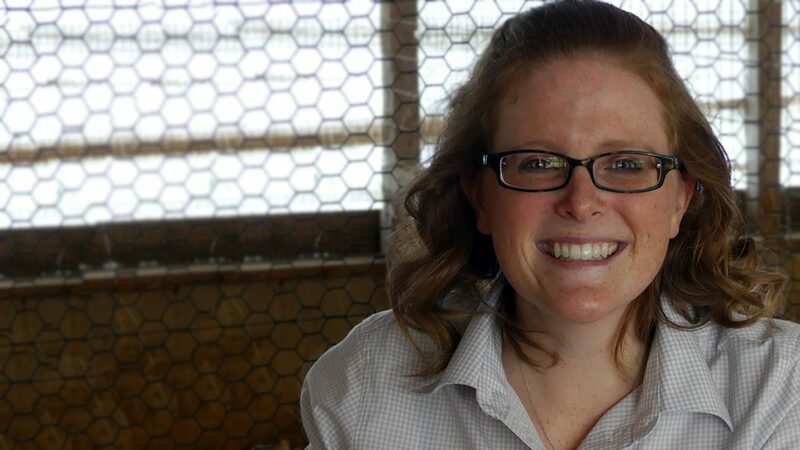 While working on cattle breeding and embryonic transfer in the cold winters of her native Wisconsin, Brooke Bartz decided to make a life change: she shifted her focus from large animal to poultry production. Bartz nabbed an animal welfare internship in the Kraft Foods/Oscar Meyer research and development department, where she developed welfare audit protocols and employee trainings on the importance of animal welfare. She then toured the poultry facilities at NC State and saw her chance to seize the growing career opportunities in the poultry industry. 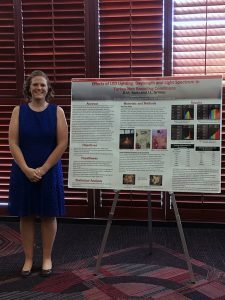 Now a graduate student, Bartz studies the effect of LED lighting on bird behavior and performance — with fascinating results. How did you get interested LED lighting-related poultry research? It began with my fascination with altering behaviors like feeding based on different colors of light. Knowing there’s something occurring at a deeper, physiological level, I was curious to see if it was simply a color difference or a type-of-bulb difference. LED lights use electroluminescence, which excites photons to create colored light by changing energy levels. Traditional incandescent light bulbs create heat, and it is the heat that causes the glow of light. These different principles cause light parameters to change, and therefore have an impact on behavior. Although the light may look similar to us, these differences in specific wavelengths emitted by LEDs are very different than the continuous light spectrum we see with incandescent lights. Why is that research important? First, it’s our duty as animal caretakers to ensure the best possible life for our production animals by following our five freedoms of animal welfare. One of those freedoms is the ability to exhibit normal behaviors. If something we’re creating in production settings is altering those behaviors, it’s our job to correct any problems that may occur. Second, the poultry industry is a multibillion-dollar industry, with an analyzed $48.3 billion dollars of sales recorded by the USDA in 2014. If changing the lighting in these poultry houses causes any changes in bird performance or production, this could have astronomical effects at a large scale. My goal after completing my Ph.D. is to continue onto a post-doc focused on LED lighting of poultry. There are so many differences between and within types of LED lights that I could spend years researching its effects on poultry. After completion of my post-doc, I’d like to stay in academia. 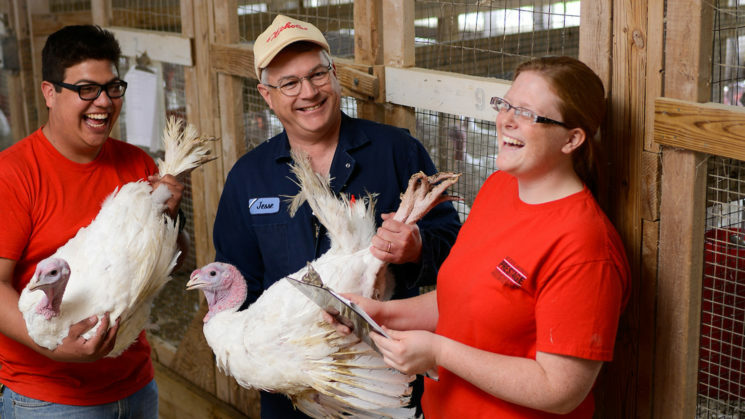 Through my teaching experience, it’s been rewarding to watch students grow in confidence as they pursue their careers in poultry production and realize that I was a part of that growth. What’s the best advice you’ve gotten while at CALS? Don’t be afraid of the unknown. Do everything to the best of your abilities and the rest will fall into place. What’s your advice to other students coming to CALS to study poultry science? First, be willing to alter your perspective. College is a place of growth and development in both a professional and personal manner. I started my college career in hopes of becoming a large animal veterinarian and now I conduct research in turkeys and turkey behaviors in relation to LED lighting. In a million years I never would have thought I’d be this passionate about my career and balancing animal welfare and animal production. Second, stay humble in your endeavors. Whether it is conducting farm chores or giving a presentation to a crowd of people in another state, it’s best to stay grounded and appreciate all the people and animals that have gotten you where you are today. Make the best of teamwork and the challenges that may present along the way because you never know where they might take you in the future. You can make a difference in the lives of students like Brooke!